Dinosaur design towel embroidered in colours of your choice with a personalised name. 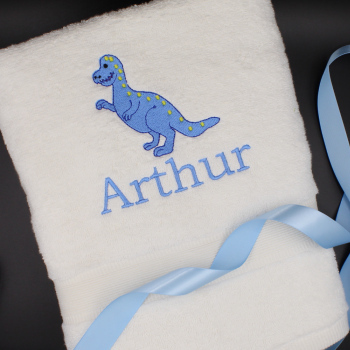 Dinosaur design towel embroidered in colours of your choice with a personalised name. Choose the towel colour. Enter the name. Dinosaur design towel embroidered in colours of your choice with a personalised name. Choose the towel colour. Enter the name. Choose the name text thread colour. Amys Gifts will beautifully embroider your custom designed bath towel. Bath size towel made from soft cotton 70x120cm.